I spent Friday and Saturday with my son Ben and one of his friends as part of Ben's 15th birthday. He said he wanted to go camping with some of his buddies, but as it turned out, only one could make the trip. I assured him that it was going to be fun whether it was one friend or three. Middle schoolers seem to do best one-on-one anyway, so it worked out well that it was just one. It was my intent to be on the road by 10:00 AM. Anyone who puts a timetable to a launch time for any vacation gets what they deserve. Unrealistic planning and packing schedules, unforeseen trips to various stores and whatnot, and of course the obligatory trip back home to get what you forgot to pack. I was running behind schedule and told Ben to tell his friend it would be more like 10:15-10:30. When I picked his friend up at 10:35, I realized I forgot the camp chairs and also the card games I was going to bring. Bear in mind that construction in our neighborhood requires a 10 minute re-route around it to get home from his friends house. Nevertheless, we got on the road at 10:50. Not bad, less than an hour late. Anyways, neither of us were going to let a schedule get in our way. We were out to have fun and we were not disappointed. It was a blast. He and his friend asked if they could turn on the radio on the way up. Thankfully they like a station that plays a fair amount of music that I like. Ben quickly rattled off the name of each group or song that came on and I filled in on the "older" ones that he whiffed on. (e.g. Pearl Jam, The Clash). It took me back to the summer days in Minnesota riding with my older brother Tom at the wheel of the 73 Impala so long ago. The only thing missing was a mono, push button AM/FM Radio playing the Doobie Brothers' China Grove. When we got to the beach at Kohler Andrea we all went in the water (Lake Michigan) which was bitingly cold at first, but then became bearable. We hung out in the sun, played Frisbee, ate Cheeto snacks and drank lots of Gatorade and water. 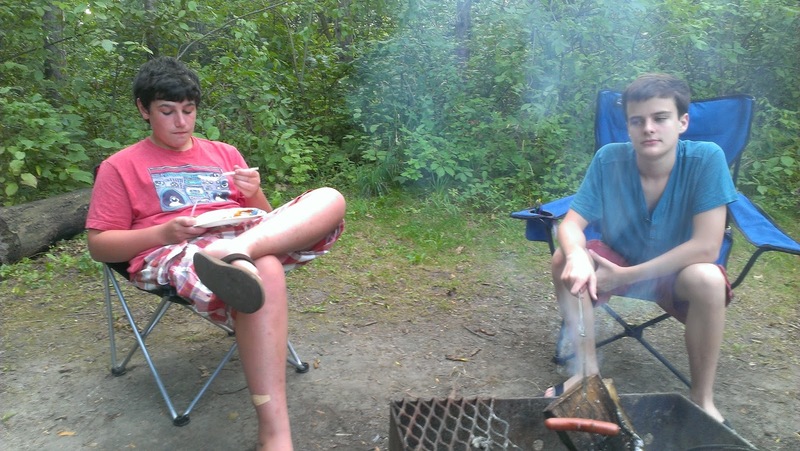 After about 4 hours of beach we set out for the Long Lake Recreation Area where we had a site reserved for camping. The boys were great about helping set up, proof that they had both camped enough to know that everyone helps. 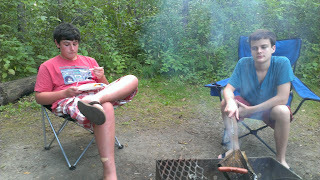 After we set up the tent and everything, I got a fire going and we roasted hot dogs over the open fire. The great thing about camping with only other guys is the expectations for food are very low. This keeps it easy for everyone. Hot dogs and beans, followed by Jiffy Pop on the stove and S'mores later on by the fire. The next morning we broke camp and set out for the Parnell Fire Tower for a hike. When we reached the top we saw an incredible vista of the Kettle Moraine State Forest. I tell this story, not because any one detail was amazing or awesome or phenomenal. I tell it because it was really, really, really good to spend time with my teenage son, who I love. It was great to talk to him about music, coming high school apprehension, stupid You Tube videos, past vacations, girls, friends, and a dozen other subjects. In our day to day recklessness, we don't always get a chance to talk in depth. There is nothing more important to me at this stage in his young life than to know that he is loved, his opinions are heard and valued and that I am proud of him. Teenage years are tough years, and as a parent, I'd like to help iron out some of the bumps before he gets to them. If that means taking him camping during an already too-busy summer, then so be it. You all need to remind me of this when I fall into the trap of putting dad/son trips (or dad/daughter or dad/daughter/son trips) on the back burner. My kids are home for one and four more years respectively. There will come a day when I'll look back on trips like this and smile and say, "This is my son, in whom I'm well pleased."